Cape Town — As Mining Indaba, Africa's largest gathering of the mining sector kicks off from 3-5 February, the African Minerals Development Centre - AMDC and the Canadian international institute for Extractive Industries and Development - CIIEID signed a letter of intent, today on areas the two parties could carry out collaborative activities. Wilfred Lombe, Coordinator of the AMDC hailed the governments of Canada and Australia for supporting the Centre's operational activities on the ground. He cited Mozambique and Lesotho as countries where the AMDC partners are working with governments to implement the Africa Mining Vision. "The enhanced collaboration gives us extensive reach in our efforts to work with African member States in the operationalization of the Africa Mining Vision for the benefit of the Continent," he said. Bern Klein, Acting Executive Director of the CIIEID said, the implementation of the Africa Mining Vision is a great framework that is organization is pleased to work with. The Letter of Intent is about developing our relationship with the AMDC to cooperate in Policy and regulatory frameworks, geological and mining mapping information systems, governance and participation and building human and institutional capacities. 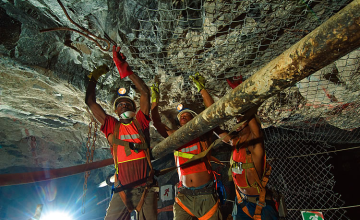 Will Mining Indaba Unlock Africa's Potential? The Investing in African Mining Indaba is an annual platform that brings thousands of participants from the mining sector under one roof at the Cape Town Convention Centre. He also underscored that the parties would aim to create a mining sector that is "environmentally and socially responsible and appreciated by all stakeholders, including surrounding communities. The collaboration also aims to promote the creation of a sustainable and well-governed mining sector that effectively garners and deploys resource rents and contributes to broad-based growth and inclusive development. Housed at the UN Economic Commission for Africa (ECA), the African Minerals Development Centre (AMDC) is implementing the African Mining Vision, which aims to ensure Africa's mineral resources can support economic growth and development. It will translate that vision into practical solutions for reducing poverty and involving people in development. AMDC is an initiative of African Union Commission (AUC), United Nations Economic Commission for Africa (ECA), African Development Bank (AfDB) and the United Nations Development Programme (UNDP).